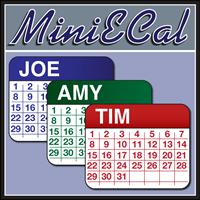 MiniECal is a utility application that provides supplemental features not available to your iPhone or iPad's Calendar application when accessing calendar data stored on a Microsoft Exchange server (2007 or later). MiniECal lets you view OTHER USERS' calendars right on your device (provided they have granted you access to their calendars) and also provides you with a list of your meetings/events today, tomorrow and meetings you have not responded to for a specified time period. MiniECal has been tested under iOS 6, and takes advantage of the 4" Retina displays on both the iPhone 5 and iPod touch! When viewing other users' calendars, you can query them on an "as needed" basis, or you can set up a group of users to view all at once. In Version 1.2 of MiniECal, you can cycle through those calendars in your defined group and view them one at a time OR show them side by side in a "graphical view". You can store your groups in iCloud for easy access from all of your iPhone, iPad and iPod touch devices. MiniECal communicates with your Exchange Server (2007 or later) via "Exchange Web Services". To configure MiniECal to work with your Exchange server, you will need to know the URL that allows you to access Exchange Web Services. This is usually "https://exchange.yourservername.com/ EWS/Exchange.asmx". Contact your Exchange system administrator for that information. Once you have entered the correct URL, simply provide your Exchange user name, password and your Exchange domain name in the "Server Settings" screen in MiniECal, and you are all set to begin viewing calendar data of others in your workgroup! Version 1.7 of MiniECal has been approved and is available for sale on the AppStore. Version 1.7 provides the ability to use autodiscover with Exchange 2007 servers, provides compatibility with the upcoming iOS 7 release and adds direct support for users who need to authenticate with a domain\user token. Version 1.6 of MiniECal has been approved and is available for sale on the AppStore. Version 1.6 provides a new System Settings Configuration view that provides much more flexibility for connecting with various Exchange servers as well as a few minor bug fixes to improve the user experience! Version 1.5 of MiniECal has been approved and is available for sale on the AppStore. Version 1.5 adds support for configuration via Microsoft's autodiscover service. Version 1.5 of MiniECal was just submitted to the AppStore for review tonight. It should be available for download in a week or so! This version allows users to simply put their email address in the configuration screen and then hit the "Autodiscover..." button to have MiniECal find and query their Exchange server for the rest of the configuration information! A new version of MiniECal (Version 1.4) has been submitted to the AppStore for review. We hope it will be reviewed and released by April 26. To get a sneak peak, check out our MiniECal v1.4 Preview page. It contains screen shots showing the new features and graphics! A new version of MiniECal (Version 1.3) has been submitted to the AppStore for review. It adds support for Exchange 2007 SP1 servers and provides more configuration options to better interface with a variety of Exchange server configurations. Autodiscover support is NOT included in this release, but is still in development. The current version of MiniECal (1.2.1) asks you to enter your domain name as a fully qualified name. An assumption is made that your email address uses a DNS name that is identifcal to your fully qualified domain name. For some users this is not the case. We will be working to incorporate the use of the Audodiscover service ASAP to allow for (1) easier configuration of the client and (2) support for users to query across multiple domains. March 22, 2013 -- Version 1.2.1 of MiniECal released! Version 1.2.1 of MiniECal fixes a bug introduced with the release of Version 1.2 regarding meeting times. In Version 1.2 we began to query iOS for the time zone that the device is currently set for and incorporated that information into the query made to the Exchange Server. During Daylight Savings Time, iOS correctly reports the adjusted time offset from GMT when making asking for the time zone. The XML code used to query Exchange also makes an adjustment for Daylight Savings Time which was resulting in "over compensation" for DST -- and meetings that were listed as being an hour later than they actually were. Version 1.2.1 fixes this problem! March 15, 2013 -- Version 1.2 of MiniECal released! Version 1.2 of MiniECal has been released and it incorporates new features such as the standard pull-to-refresh mechanism introduced with iOS 6.x and a new "graphical view" mode which shows a graphical "week-at-a-time" style view of a single person's agenda OR a group of people. For more information please see the MiniECal manual, downloadable from the side bar to the left. Version 1.0 of MIniECal has been released! MiniECal is an Exchange Calendar assistant designed to supplement the functionality of the built in Calendar application in iOS when using it with an Exchange calendaring environment. MIniECal allows you to view the calendars and meeting details of other users on the same Exchange server--provided you have viewing rights. If you do not have viewing rights, it is capable of displaying Free/Busy information for other users. You can also create ad-hoc groups of users and view the agendas as a group. MiniECal works with Exchange Server 2010 or later, as well as Office365. This app simply does not work. A total waste of money. Don't get conned. There are many different ways to configure an Exchange environment and we cannot claim to have tested MIniECal with every possible configuration. If you have purchased MiniECal and have experienced difficulties, PLEASE contact us at support@sandcrater.com and we will work with you to find the configuration difficulty. If the problem is resulting from a bug in MiniECal, we will work with you to fix the problem and get you working as soon as possible. With a little guidance from the Developer I got it to work. It's just what I needed. Thanks for the feedback and thank you for you suggestion to be more clear that the domain should be specified as a fully qualified domain name. I have incorporated an additional message in the configurarion screen in version 1.2. MiniECal is loosely based on work I had done as an employee at Cornell University in their central IT organization. It was 2008 and the iPhone was beginning to gain traction on campus. At the time, Cornell used a calendaring system originally called “Corporate Time” that was later bought out by Oracle and renamed “Oracle Calendar”. Users of the original iPhone did not have any way to cleanly “hook up” their phones to the enterprise calendaring system with the exception of various third party “sync” tools that relied on syncing the enterprise calendar to iCalendar on their Macs and then using iTunes to bring the calendar data over to their phones. This process worked most of the time, but when it didn’t work users would end up with duplicate and triplicate meetings on their iPhone and it could be a bear to straighten out! Additionally, the synchronization model did not allow the opportunity for a user to look at another user’s calendar from the phone (a function that was commonly exercised when using desktop clients). To solve these problems I set out to write an iPhone application that would communicate directly with the Oracle Calendar server and present information about a given user’s agenda and agendas of other users on demand. While the details of such an implementation are not relevant to this preface, the experience gained through this exercise was very useful when designing and implementing MiniECal.